--What is the highest technique you hope to achieve? --To have no technique. It is impossible not to think of tango, hearing some of the conversations in the Bruce Lee film Enter the Dragon. --Kick me (Bruce Lee to one of his students) student kicks --What was that? An exhibition? We need emotional content. Try again. student kicks again --I said emotional content. Not anger. Now, try again. With _me._ student kicks again --That's it, how did it feel to you? --Let me think... slaps student --Don't think! Feeeeeeel! My apologies to TP for ripping off some of his old fb posts (“I was learning tango from Bruce Lee”), but even if I have no clue about martial arts, I find it very intrigueing, and getting lost in procrastination research for this post, I kept finding analogies with tango. There are great differences, of course, but the smooth movement, the groundedness, playing at the limits of balance… If you ever thought of giros and ganchos being metaphors of street fights as far fetched, have a look at the final fight between Bruce Lee and the Big Boss in The Big Boss (yes, I know). Some ganchos! Martial arts using balance to trip the opponent over, tango challenging balance, only to make sure your partner is perfectly safe and on balance. I would be very surprised if a solid foundation in martial arts was not a great asset when learning tango. Or maybe rather taking up the practice of tango. In many ways tango is better thought of as a practice, rather than something you “learn”. I’ve been watching several Bruce Lee films over the last months, including several documentaries, and it struck me that his moves seem so fresh, even today, more than forty years later. Indeed a testimony to the greatness of this icon of martial arts. The ballet like choreographies are, somewhat paradoxically very extravagant, in contrast to Bruce Lee’s philosophy of a minimalist martial art. 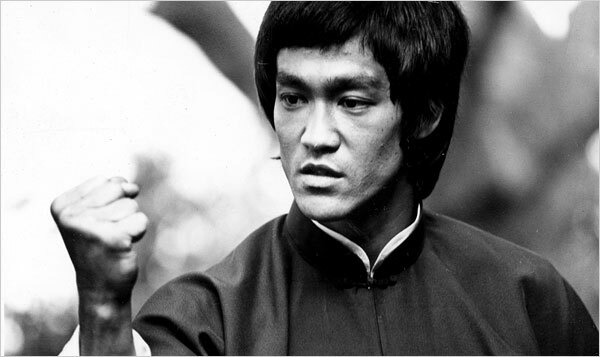 The art of “fighting without fighting” as he says in Enter the Dragon. The screen tests he did before starring in Green Hornet were brilliant, and some of his demos from California likewise. Bruce Lee was trained in a style of Kung Fu called Wing Chun, and there is a documentary on youtube about Wing Chun that seems authentic to me. Again the tango similarities jump at me. Maintaining center line, groundedness, pivots and relaxed, economic movement, and a technique called “sticky hands” where you keep contact with the opponent all the time with the arms to feel his next movement almost before he does himself. The break of rhytm is also a very interesting concept. This concept of establishing one rhythm and speed and then deviate from it as a surprise also works wonders in the tango. Struggle to find the authentic, master of the master, does it sound familiar? In his practice what I saw wasn't movement, but essence. I want to learn tango from Bruce Lee, too. Or rather, from Ip Man. El maestro del maestro.